Shower faster. While this may be an obvious recommendation, there’s a reason it’s first on our list. Studies have found that reducing your shower time by just four minutes can save nearly 4,000 gallons of water over the course of a year, which is beneficial for both your wallet and the environment. Choose ENERGY STAR® appliances. By replacing your dishwasher and washing machine with ones that have received the ENERGY STAR stamp of approval, you’ll significantly cut back your energy and water usage. In fact, by switching to ENERGY STAR-rated appliances you can save up to two gallons of water each time you run the dishes and as much as 20 to 30 gallons each laundry cycle. The less water you use, the cheaper your water bill will be. Store drinking water in the refrigerator. While residents of many other states tend to avoid drinking tap water, we Washingtonians are blessed with clean, delicious-tasting tap water. When you go to fill a glass with water, instead of running the tap until it’s optimally chilled fill up a pitcher or two and store them in your fridge so you always have cold water that’s ready to drink without having to run the tap each time. Only run full loads of laundry and dishes. By only running your clothes or dishes through the washer when you have a full load, you’ll significantly reduce the number of times you need to run these machines and will save water and money as a result. Go with the (low) flow. Installing low-flow toilets and showerheads, or converting your current ones, is a great way to drastically reduce the amount of water you use (and waste). By switching to a low-flow toilet you can save as much as two to five gallons per flush. A low-flow showerhead could cut the amount of water you use while showering nearly in half. Avoid washing dishes by hand unless absolutely necessary. While certain types of dishware will always need to be washed by hand, the dishes most people use on a daily basis can, and should, be washed in the dishwasher. By letting the machine do the dirty work for you, you’ll not only use about 1/6 the amount of water you would if you hand-washed the dishes, you’ll save precious time as well! Don’t allow the water to run while shaving, brushing your teeth, etc. It may be a habit, but do your best to avoid making this mistake, as it’s a complete waste of water and money. Instead, turn off the water immediately after you’ve rinsed your toothbrush or razor, and leave it off until you’re finished and ready to rinse off your face or your toothbrush. Studies suggest that making this simple change can save up to three gallons of water each day! Has Your Monthly Water Bill Seemed Higher Than Usual? If you’ve noticed a recent spike in your monthly water bill, it’s highly possible you have a leak in your main water line. 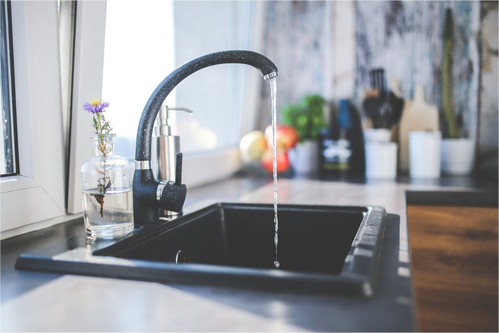 It’s important you have this issue checked out by experienced professionals, such as those at Puget Sound Plumbing and Heating, to ensure a small leak in your water main doesn’t turn into a much larger and costlier issue down the road. When you call on us, you can trust our experts will always use the latest electronic equipment and unwavering attention to detail to find and fix the leak well before it has a chance to wreak havoc on your home or business. Contact us online to learn more about our prompt, reliable water line repair services or to request emergency service 24 hours a day, seven days a week.